Combination of a small amount of Calcium Chloride with a natural clay that gives high absorptive properties. Dehumidifying agent for containers and for general applications. The 2-kg, 1-kg and 500-gm bags are packed in nonwoven fabric , woven fabric or a combination of these fabrics. The 1-kg and 2-kg bags are fitted with plastic hooks or shoe strings for them to be hung from the container hooks. 1.Check desiccant packaging on delivery. In the event of damage to the outer packaging material the desiccants are most probably exposed to the atmosphere and therefore the product is exposed . Do not accept the goods. 2.Open the protective plastic bag only when ready to use the desiccant. After use, if some desiccants are still left over in an opened bag, securely close the bag to ensure that no free moisture can be absorbed by the desiccants. Or put the unused desiccants in an air-tight container. 3.If, for some reason, the protective plastic bag has been left open for a period of time , weight some of the desiccants to establish if their weight have increased. If there is a weight increase of more than 15%, it is strongly recommended not to use the desiccant. 5.The product in its original unopened packing has a shelf life of at least one year if stored in a dry place at 25 deg.C and RH <= 60%. 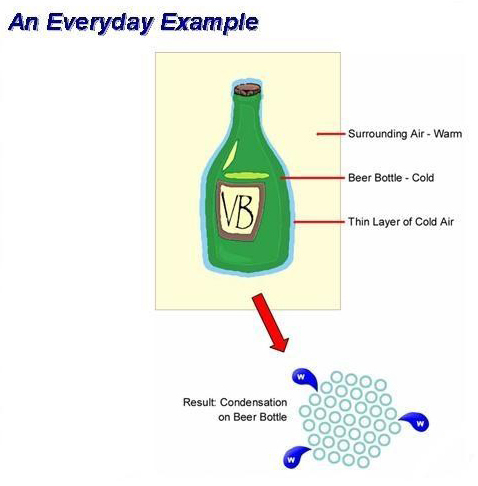 Container desiccants are used to adsorb the excess moisture in the surrounding air inside a closed container thus preventing condensation from taking place when the atmospheric temperature drops .The temperature drop may occur due to change in weather , at night or when the vessel moves to a different climatic zone. The condensation will take place as cargo sweat or container rain . 1) How to use it? A = Area of container(barrier) in sq. in. V = volume of rigid container in cubic in. What is a desiccant and how does it works? This is the most common desiccant which can be found in bottles of medical or vitamin capsules/tablets. It is actually a chemically produced non corrosive form of silicon dioxide and comes in grains or beads.. The many interconnected pores in the grains adsorb moisture from the air and hold them by capillary action. As it is relatively more expensive , silica gel normally comes in small satchets ranging from 1gm to 50gm and placed with the products to keep them dry. Some types of clay like montmorillonite and bentonite behave like a dessicant as the minute pores between the grains adsorb moisture from the air. The clay also has the ability to hold a significant amount of water. The clay is packed in nonwoven bags in 500gm, 1-kg or 2-kg packings as clay is much cheaper than other desiccant types. A small amount of the hygroscopic salt, calcium chloride, may be added to the clay( called activated clay or mineral desiccant) to improve its adsorption capacity. This is a synthetic desiccant manufactured as crystalline hydrated aluminosilicates .The small pore sizes of the cystalline particles will adsorb moisture from the air . It is relatively most expensive and normally packed in a cylinder for in-line drying of gases. This is a hygroscopic salt which can absorb up to ten times its weight of moisture under the right conditions. It is normally placed in a plastic container to hold the big amount of resulting salt solution. The salt solution can cause corrosion when it comes in contact with the product or container. The latest development include the addition of gel to the clacium chloride so that the salt solution is held by the gel( very much like the baby diaper). This enable the calcium chloride & gel desiccant to be packed in nonwoven bags for cheaper packaging and easy use inside the container. We can leave a 1-kg bag of container desiccant in the open in our office after taking down its weight. Continue to weigh the bag of desiccant every day at about the same time and record its weight till there is no more change in weight for 3 consecutive days. Plot the weight gain percentage ( weight gain divided by the initial desiccant weight ,expressed in percent) against the number of days on a graph.It will typically look like the graph below. The weight gain percentage will rise rapidly for a few days and then starts to reach a plateau after many days. The gradient is a measure of how fast the desiccant is adsorping moisture from the surrounding air and is called the rate of adsorption .The plateau indicates that the desiccant has reached its saturation point and it is called the adsorption capacity of the desiccant .This measures the maximum adsorption capacity of the desiccant. 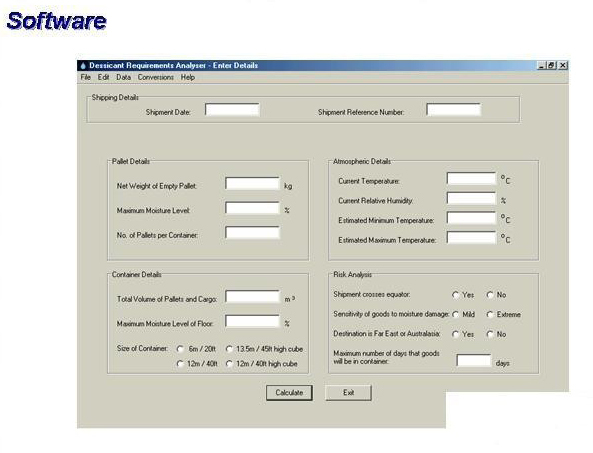 The adsorption rate and adsorption capacity changes with the relative humidity (RH) and ambient temperature .Therefore in the specification sheet for the desiccant the manufacturer will indicate the RH and ambient temperature for their data. For practical purposes, we can use this method to evaluate any desiccant which we intend to use . Moisture in the form of water vapour is ever present in the surrounding air . The amount of moisture that the air can hold is directly proportional to the temperature . When the ambient temperature is higher during day, the surrounding air will draw up moisture( a process called evaporation) from any source with water content , for example ,the container floor ( which is wooden) , wooden pallets , wooden crates or from the cargo if it contains moisture. 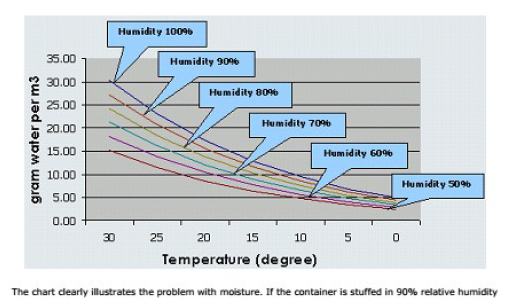 However , when the anbient temperature drops (example , at night) the surrounding air cannot hold the excess mositure(as the relative humidity,RH, cannot exceed 100%) which will then condense onto the roof the container . 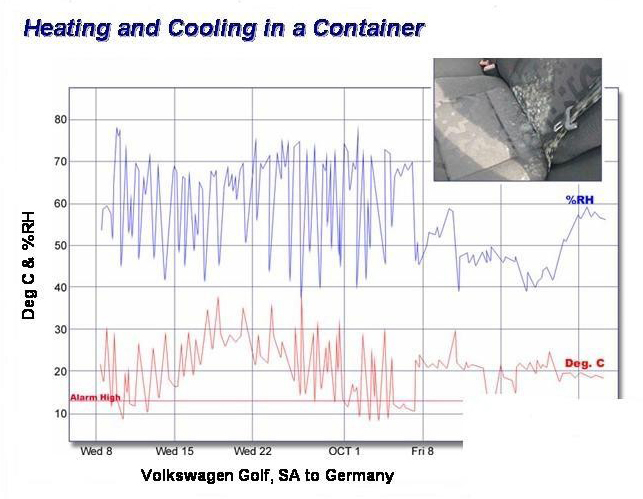 This condensation will then fall down onto the cargo – a process called container rain.This drop in temperature happens daily according to the time of the day or due to changes in the weather conditions(eg. 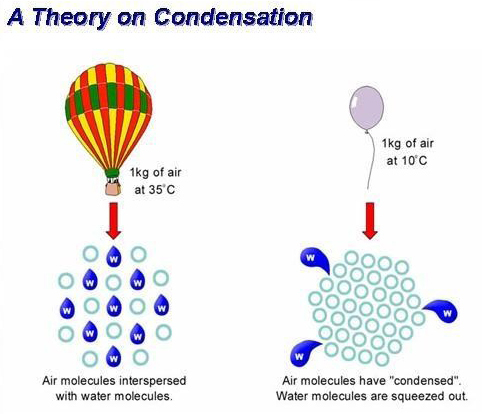 from sunny to raining) .When the vessel moves to a different climatic zone( eg, from tropic to a temperate zone) , the changes in anbient temperature also takes place .This evaporation and condensation cycle takes place continually, following the changes in the ambient temperature. 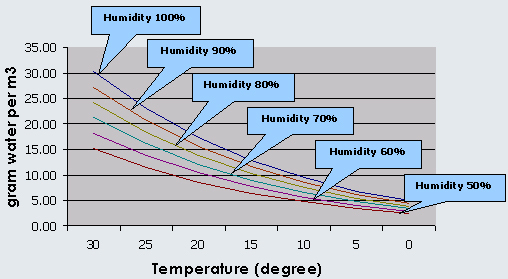 Moisture content in air ( Available from psychometric charts) Take as 27gm/m3 of moisture in air at 30degC and 90% RH. Look at the type of cargo and work out the amount of moisture from the product data sheet or get from the product manufacturer. Measure the moisture content % using a moisture meter. Find out the adsorption capacity of the desiccant used. This is normally given as % of its dry weight in the data sheet . It tells us how much of moisture will be adsorped by the desiccant as a percentage of its dry weight. Eg. An AC of 50% means 1-kg of desiccant will adsorp ½ kg of moisture at saturation. The minimum amount of desiccant required is 8 kg for 20-footer or 16 kg for 40-footer. Ensure that the container floor is dry before loading in the cargo.Otherwise, exchange for one with a dry floor or open the doors and let it air dry. Cover all the air ventilating holes in the container with masking tape . These are normally found at the top of the container walls – one set at the rear end and the other set at the door end. It would be a great help to line the container floor with plastic sheet before loading in the cargo . This will reduce the amount of moisture that will be released by the container floor. Any PP or PE sheet ( new or old, thick or thin ) can be used. It is recommended to increase amount of desiccant used by 10- 15% during the winter months at the receiving destination. This is because the low temperatures will lower the condensation point drastically. where: K=Amount of desiccant required in kg. The default amount for a 20-footer is 8kg and 16kg for a 40-footer. It is assumed that the goods and its packaging does not contain water . It is assumed that the free air space inside the container after loading is 10%. It is assumed that the average weight of a wooden pallet is 20kg and mositure content is 12 %. 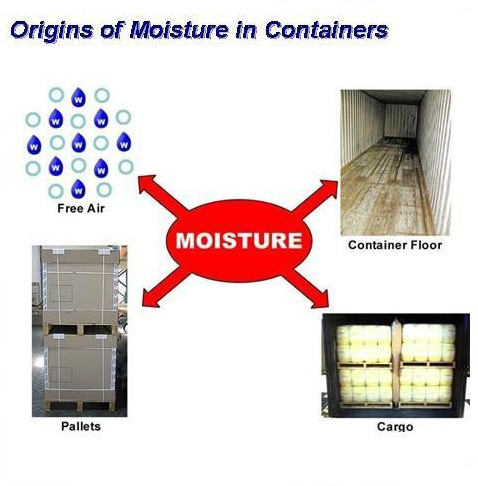 It is assumed that the average moisture content of the container floor is 12%.